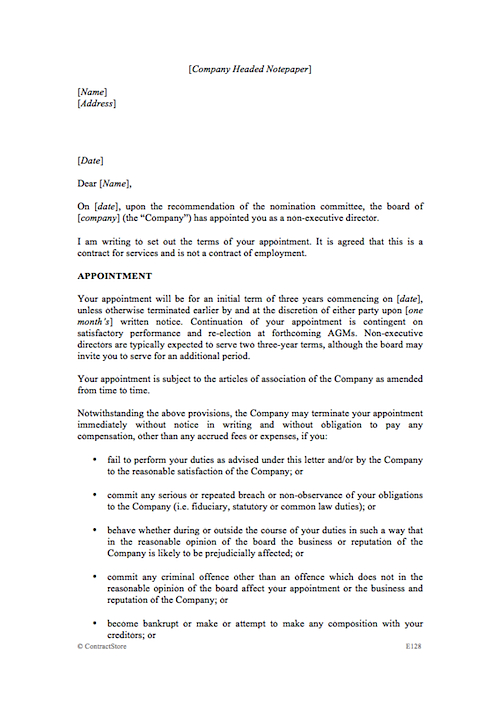 This appointment letter for a non-executive director is based on the sample letter found in the Good Practice Suggestions from the Higgs Report. 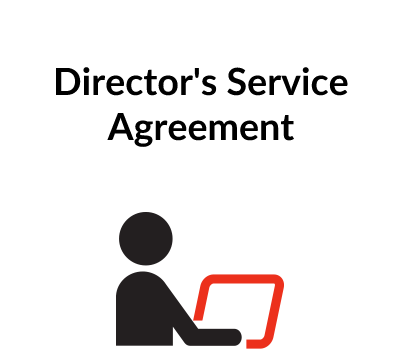 the right of the director to seek independent legal advice. The letter should be presented in duplicate to the director so that he or she can retain one copy for their records. Given that many non-executive directors are not employees, the practical, straightforward format of the letter is invaluable in clearly detailing the non-executive director’s role within a company. This appointment letter for a non-executive director is based on the sample letter found in the Good Practice Suggestions from the Higgs Report. However there are a number of additional clauses which have been added (e.g. data protection). Most non-executive directors are not employees, and therefore do not have a contract of employment. Exactly how non-executive directors are appointed depends upon the wording in the company’s articles of association. The first paragraph provides for an initial three-year term of appointment which can be terminated by either party by one month’s written notice. Many non-executive directors typically serve two such terms. The clause goes on to identify the grounds upon which the company may terminate the appointment immediately without notice or any compensation, other than accrued fees or expenses. Non-executive directors should disclose any other significant time commitments which he or she may have prior to appointment. If the non-executive director wishes to make any new material commitments, he or she will need to seek prior approval from the chairman. These provisions set out the non-executive director’s duties and responsibilities. Fees paid to non-executive directors should reflect the time, commitment and responsibilities of the role. The amount may also be subject to the articles of association. A non-executive director is deemed to be an “office holder” for tax purposes, and therefore the company must pay any fees to the director after the deduction of tax and national insurance. If a non-executive director wishes to supply additional consultancy services to the company (beyond his or her duties as a director e.g. financial expertise), then the company should enter into a separate consultancy agreement. The non-executive director has an ongoing obligation to disclose any conflicts of interest. This provision outlines the director’s duties of confidentiality during and after his or her appointment. The chairman is responsible for ensuring that any new non-executive director receives a comprehensive, formal and tailored induction. The company should carry out an annual review of all directors, the board itself and any committees. A copy of the applicable insurance policy should be supplied to the non-executive director. 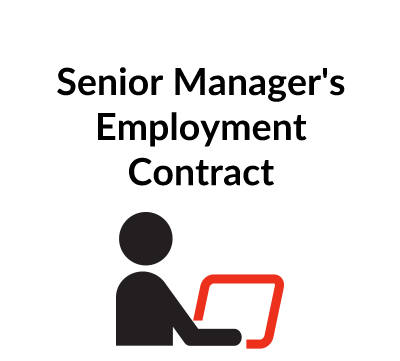 Situations may arise where a non-executive director will need independent legal advice, such reasonable costs should be borne by the company. For more guidance on a company’s data protection responsibilities, see http://www.ico.gov.uk/for_organisations.aspx which is a link to the Information Commissioner’s Office. 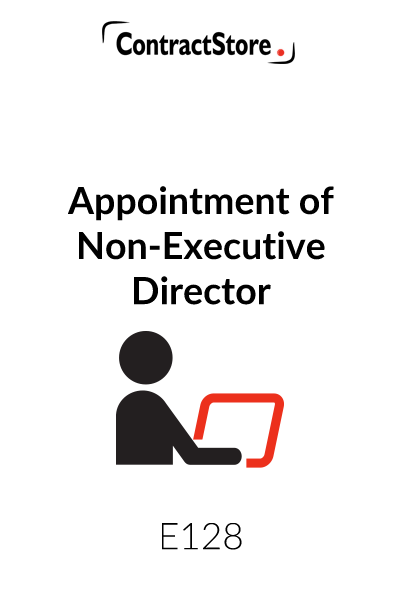 The company may request the non-executive director to serve on a board committee. Such an arrangement should be subject to a separate written agreement.